Instructor User Guide LessonsHow do I export Lessons content? The Lessons tool allows instructors to export course content in IMS Common Cartridge format. If your Lessons contain links to site activities (e.g. assignments, forum topic, or quizzes) or resources (e.g. files, url links) those items will also be exported in the content package. 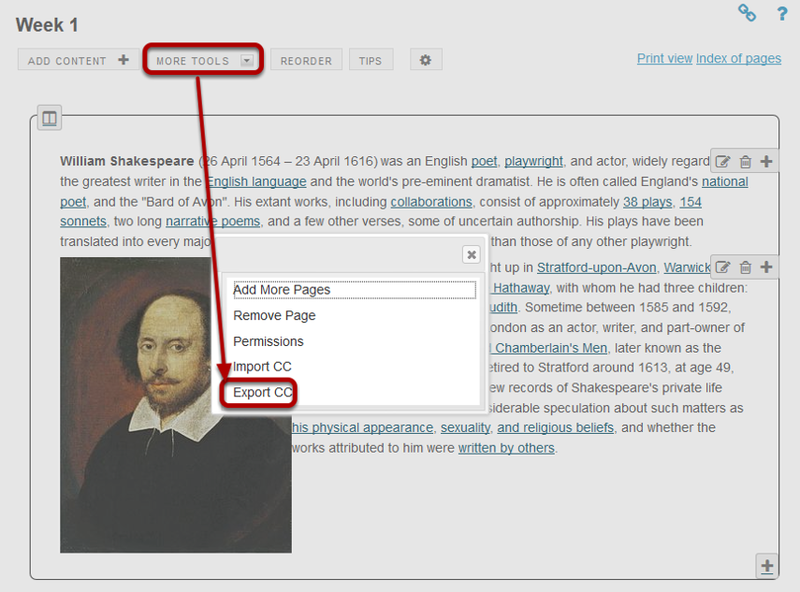 Note: Pages added by students via the Student Pages tool are not included in the export file. Click on the Lessons Page Title (e.g. Week 1) in the Tool Menu to display the page. Note: You must be on a top-level page to export Lessons content. Click More Tools, then Export CC. Zoom: Click More Tools, then Export CC. From the More Tools drop-down menu, select Export CC to display the Export IMS Common Cartridge dialog. Choose the desired options and click Download. If your Lessons include a link to a quiz that draws questions from a question pool, check the Include all question pools you can access as a test bank option. If the Lessons are destined for use in Moodle or Blackboard LMS, check the Use old version of file option. If the Lessons are destined for use in Canvas, check the Use newest version option. Prev: How do I delete a Lessons subpage? Next: How do I import Lessons content?